Well, Thanksgiving is practically knocking at our door now. Has your mouth begun to water yet? I recently shared a couple of family recipes for cherry pie and dixie pie, and in both of those posts, I promised I would also share a recipe for how to make a spectacular crust. According to my grandma, this is just about the best made from scratch pie crust recipe out there. My mom has told me that when she was young, my grandma began searching for a good pie crust recipe. Supposedly, she tested out numerous different recipes before finally deciding that this one was the winner. It is the recipe that my grandma used for the rest of her life. It is also the recipe that my mom has always used, and in turn, it is now the recipe that I use. The first thing you want to do is mix all of your ingredients together well. This recipe does call for shortening, which won’t blend smoothly. I find it easiest to use a mixer for this step, but it’s not necessary. I think my mom just uses a fork. The main thing is, you want the shortening to be reduced to small, pea sized clumps. Once you have the dry ingredients mixed and the shortening has been reduced down to small clumps, you want to slowly add water and mix in. The recipe calls for 1/2 c. cold water. My mom taught me to add an ice cube or two to the water. I usually add about a tablespoon at a time. Sprinkle it over a part of the mixture, then gently mix it in with a fork. The mixture will still appear pretty dry and loose once all of the water has been added. 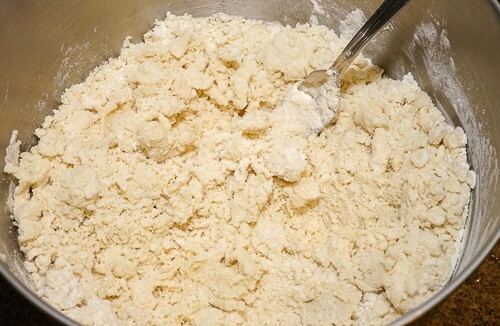 Not quite all of the water had been added here, but the dough will look similar to this. Then, you want to gently work the dough together with your hands. You don’t want to over knead it. It just needs to be worked together into a ball. I divide my mixture into three separate balls, in order to roll three crusts out. So, this one recipe will provide you with crust for both the Dixie pie (1 crust pie) and the cherry pie (2 crust pie). Pretty sweet, huh?! Next comes the rolling. I usually just clear a space and roll right on my countertop. Make sure the surface is nice and clean, and make sure that you have plenty of flour at hand. You will want to keep all surfaces floured well, otherwise the crust will stick to everything. 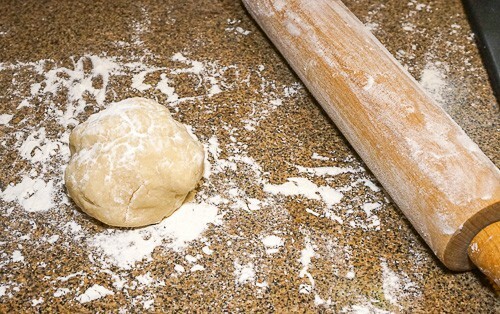 So, flour up the countertop, the dough ball, and the rolling pin. 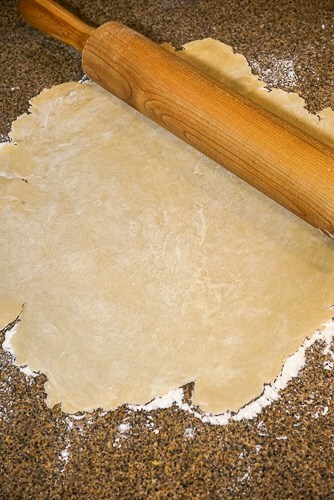 You will need to continue to flour the crust and/or the rolling pin periodically as you roll. I try to roll the crust out pretty thin (although I can never roll it as thin as my mom does). If you are unsure of when it is large enough, just take your pie pan and hold it upside down over the crust. You should be able to eyeball it from there. Then, I fold the crust in half. I find it is easier to pick up this way, as well as easier to get centered in the pie pan. 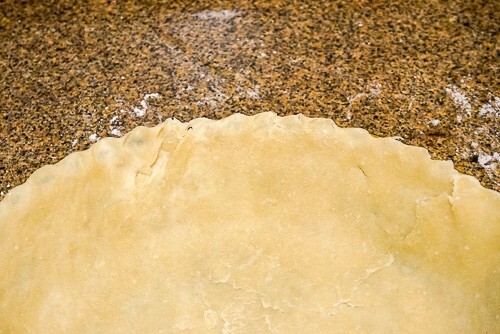 Lay the crust over half of the pie pan, and simply unfold it. 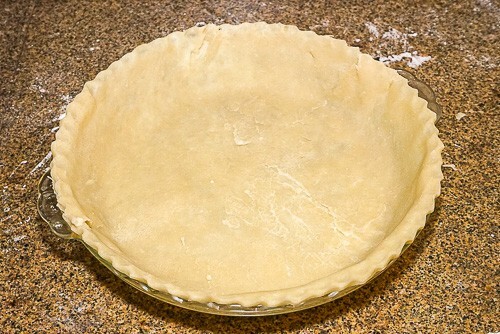 If you are doing a single crust pie, trim off the excess. You will want just a small amount of dough up above the rim of the pan for fluting. 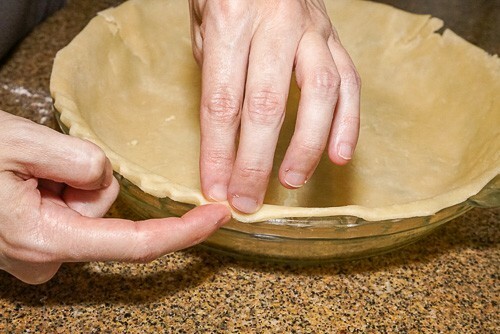 An easy way to create fluting is to take two fingers on the inside of the crust and press one finger on the outside of the crust into the middle of those two. Then, simply work your way around the entire crust in this manner. You will probably feel that your first couple of attempts at this are pretty unsightly. I know that’s how I felt. You will be amazed at how quickly you get better at it though. And as you can see in the following photo, my crusts are still far from perfect. So, don’t give up after the first attempt or two. And remember, it will all taste the same! And that’s it! 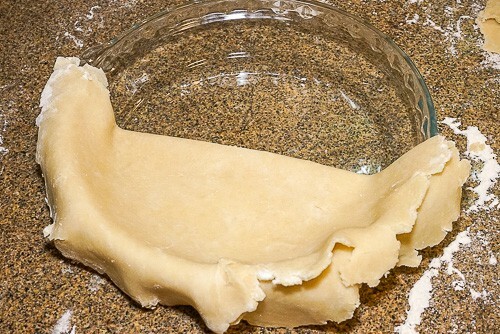 If you’ve never made pie crust before, congratulations on your first one! It wasn’t as hard as you thought, was it? If you are going to be adding a top crust, don’t flute the edges just yet. 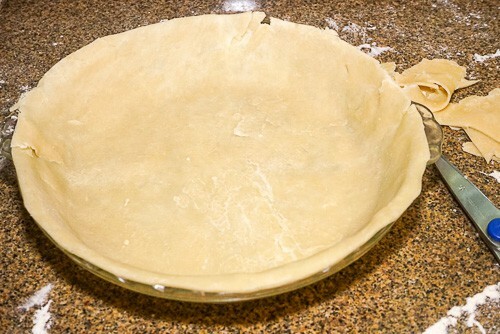 Once you have filled the pie, roll a second crust and place it over top of the filled pie. Cut off the excess as you did with the bottom crust. Use a bit of water to help seal the two crusts and push them together around the entire circumference. Then, you can flute the edges. 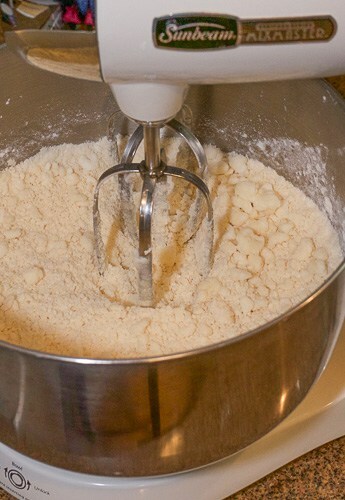 Gently knead until mixture is formed into a ball. Now, hopefully, I have helped you get your dessert game ready for the coming holiday. Don’t forget to check out my cherry pie and dixie pie recipes for a couple of delicious filling ideas! I’m one of those people who have never even attempted making my own pie crust. It always seemed like such a complicated business. All that rolling and kneading and stuff. Sorry this is probably a really silly question, but is shortening like butter or something Amy? 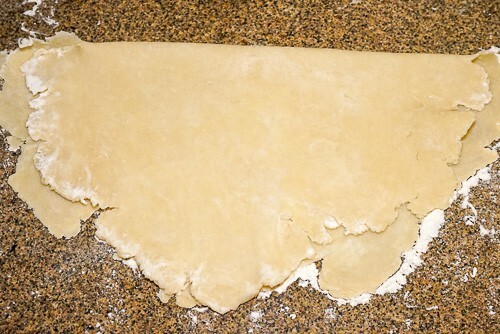 There’s nothing like homemade pie crust! 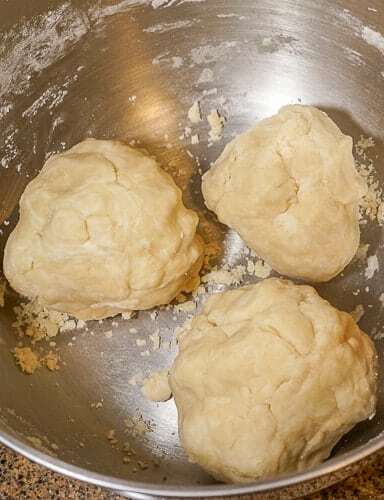 Wow, good post, now I have another recipe for pie crust, It is always good to make our own instead of buying from the shop. I have a question, in ingredients you mentioned Crisco, what is it? Is it butter or oil? I want to try this recipe. Pie crust is not one of those things I’ve ever been too good at. Ha! So I don’t, but I must say, you made this sound easy. I might have to give it another whirl. Amy this is a great recipe, I use olive oil since we had it in abundance in Greece but otherwise it is the same. Happy Baking!